Looking for a pocket-friendly surfing adventure? Why not join, Adventurekeys budget surf camp? It is an ideal combination of Moroccan hospitality, excellent food, a secluded and tranquil vibe and all you need to immerse yourself in the exceptional surf spots around Taghazout. 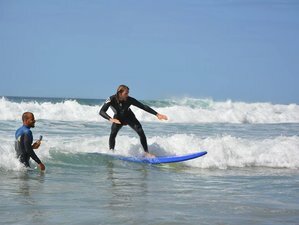 Come, learn to surf, meet like-minded people, and enjoy all facilities and hearty support to make you feel right at home. Participate and get an opportunity to get a taste of the surfing life! You will be staying in a shared dorm with linen, blankets, and towels for showers at Adventurekeys Taghazout surf hostel. This surf hostel is located one-minute from the main street, behind Cafe West Coast. The house features a large terrace lounge and Aerial yoga rooftop, offering panoramic views of Taghazout Bay. From the terrace, you can view the main surf spots of Taghazout; Anchor Point, Panoramas, Hash Point, etc. A few meters from the beach, the surf house offers you all the comforts of home. The house is shared with other surfers, living together in a relaxed atmosphere that everyone can appreciate. Adventurekeys pride themselves on their hospitality and friendly staff to make your surf holiday in Taghazout a memorable one. With nine dorm rooms (four and six beds each) and seven private rooms, Adventurekeys Taghazout surf hostel can house up to 50 guests. For entertainment, the surf house includes Fibre Optic Wi-Fi, pool table, foosball, TV and X-Box, games, Jacuzzi, and sauna. The rooftop is the perfect place for you to sunbathe, relax on the sofa with a book or just watch the divine sunset with friends. The rooftop is also equipped with basic gym equipment, mats, and Aerial yoga hammocks for your yoga practice. Whether you are feeling social or lazy, our surf house offers many cozy areas for you to feel at home. The surf house fleet of three vans, one car, and 20 surf scooters offer ample seats for you to choose your ideal mode of transport. Depending on your surfing level, you can either join the group guided by the surf coaches, or rent a surf scooters to go surfing. Each surf scooter comes fitted with a detachable surf board rack. Minutes away from the surf hostel, you can find a pharmacy, local shops, restaurants and cafes, and also little streets to explore. You may consider exchanging local currency at the airport, as there are no ATMs in Taghazout. The nearest bank is 10 kilometers away in Aourir (Banana Village). The nearest money changer is in Tamraght village, which is approximately five kilometers out of Taghazout. During this seven-day surf stopover in Taghazout, Morocco, you will be learning surfing 6 days of the week with an option to replace 1 surfing day with Paradise Valley Day Trip and free surf time early morning or evening. Apart from that, you will have access to the surfboard and wetsuit throughout the day allowing you the freedom to surf whenever you feel like. Adventurekeys would be providing up to 6 surf spot transfers. Please note that before you join us for your epic surf trip, it is important to remind you how general health and fitness will be important during your stay with Adventurekeys. Therefore, Adventurekeys highly recommend that you prepare yourself physically as well mentally to get right into it from day one. Surfing uses a lot of muscle groups that you may not fully be in touch with, and no matter how fit you are, sometimes, your body will be shocked by the kind of physical challenges surfing can pose. In general, the fitter you are the better you will be, but that not a thumb rule to feel overconfident about your surf skills. This surf camp is located behind Cafe West Coast in Taghazout Center in Taghazout, Morocco. This surf camp includes all three meals, fruit, and one-litre water everyday. You will get a variety of cuisines through a changing menu, everyday. Start your day with a hearty breakfast including cereals, yoghurts, juices, shakes, omelet, tortilla, pancakes, crepes, assorted breads, preserves, and even cream cheese! For lunch you will get a baguette with the filling of the day or a healthy salad, prepared fresh, everyday. Along with that you will be offered one-litre mineral water and fresh fruits to complement the lunch served to you at the beach. After a hard day's work at the beach, Adventurekeys will pamper you with traditional Moroccan delights or continental dishes, depending on the day. You will dine at Adventurekeys very own restaurant West Coast, where the in-house chefs cook everything from scratch using fresh preservative free ingredients. A range of delicious dishes including Moroccan tagine, Moroccan pasta with meatballs and/or vegetable sauce, cous-cous on Fridays, pizzas and burgers, each night the dinner is finger-licking good! Every Saturday night Adventurekeys have a barbecue as well. Please note that Adventurekeys provides for vegetarians and vegans, and can on prior notice create a menu to suit for special dietary needs. If you’re surfed out, you can tan on the beach and take a camel or horse ride or shop in the local curio shops. You can go hiking in the surrounding areas to beautiful caves overlooking the bay. You can take a trip to the local souk market in Agadir or hang out at the Marina there. You can go to the traditional Hammam (bathhouse) and get a massage. Sauna can be used once a week with extra payment of 3 EUR for 45 minutes. You can rent scooters and cruise up the coast or go to Paradise Valley (40 minutes drive away) and swim in the rock pools up there. You can try fly boards and jet skiing. You can rent quad bikes and speed up and down the beach and into the hills. Most of all, this is a place to relax and recuperate.